Fallout is an extremely common problem, yet because the cause is microscopic, people generally don't notice until the damage is done. Even then, they rarely know the cause. The term fallout refers to tiny airborne particles of steel, iron and other metal alloys. 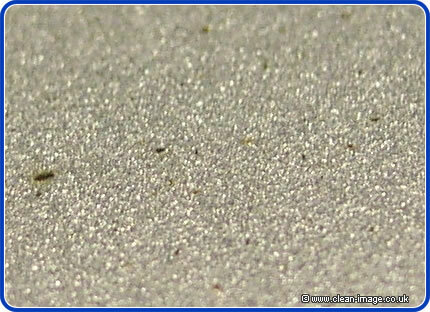 The most common source of these is from railway lines, which is why this phenomenon is often called 'rail dust'. The effect of the train's wheels on the rails, the train's brakes and the electrical pickups scraping on the overhead power lines produces tiny, often microscopic metal particles which carry a negative charge, while your car has a positive charge. 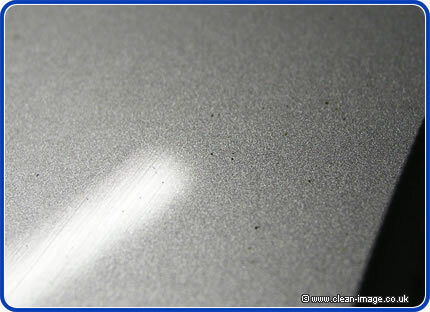 This means that your car acts like a magnet, attracting all these particles to your paintwork. Railways are not the only source of this dust. Just about any process where metal moves against metal will produce fallout. Even your own car's brakes and engine produces fallout, as will old lorries and buses that pump out black smoke as they clog up Britain's already overcrowded roads. Of course, if you park your car anywhere near factories and foundries, manufacturing plants or even a car body shop which uses welders and grinders, you expose your car to a degree of fallout which floats about in the air until it lands on your paintwork. To sum up, all cars will have some amount of industrial fallout or ferrous metal contamination. The severity depends much on where you drive your car and more importantly, where you park your car. Without a doubt, it's those people who drive to and park near railway stations that most often suffer the problems, although those that park on industrial estates come a close second. This being England, sooner or later it is going to rain, and when it does, those ferrous metal that are attached to your car are going to rust. Rust is an example of the process of oxidization, a powerful chemical reaction that produces corrosive chemical compounds which then eat into your paintwork. For those of us not paying attention in chemistry class, oxidization is a bad thing! The process creates acids which destroy the binders in the clear coat. Eventually it will eat through your paintwork to the metalwork and then your car is in trouble. Paintwork is not solid. If you look at it under a microscope you would see that it is full of holes like a sponge and as your paintwork corrodes, the oxidizing compounds seep deeper into these holes. Also, as the paintwork erodes under the metal particles, they bury themselves deeper into the paintwork. This makes it difficult to remove as it cannot simply be washed off. As the oxidization process requires water, washing you car will actually speed up the process. One method of removal is acid washing. The acid eats out all the fallout and corrosive compounds, the acid is then neutralized with alkaloid soap. 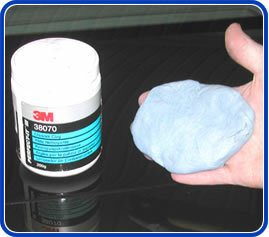 Another method of fallout removal is with 'clay bars', these are like soft erasers which contain special chemicals to neutralize the effects of the fallout and remove the metal particles. The best method of preventing the effects of fallout is to avoid taking your car to areas where fallout is a problem. If you must park in the railway station car park, try to park as far away from the line as possible. Luckily, because rail dust is heavy, it doesn't travel very far, so the further away you park, the less the problem. Even 50 yards will make a large difference. Unfortunately, nothing will prevent the damaging effects of metal fallout if it gets onto your car. In the past, paints used in the automotive industry were quite corrosion resistant, but unfortunately, the Isocyanide based paints are carcinogenic (can cause cancer) and the strong solvents used to apply them are also harmful. Over the last 15 years these paints have been replaced with paints which are safer but not nearly so resistant to the nitric and sulphuric acids which are produced by the oxidization of ferrous metal fallout. A paint sealant such as Supagard or Diamondbrite, will act as a protective barrier, but because paint sealants are similar in chemical composition to paintwork, these too will be eroded in time. Hopefully by this time it will have done its job. Your car should be kept clean and the level of contamination and damage should be checked upon at least once every few months. That said, our best advice is to stay away from factories and railway lines. Selling your car? Our guide has all the answers for how to sell your car for more money. An article by highly respected Industry insider Ron Ketchum of Auto International inc.